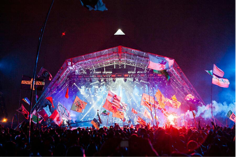 The Glastonbury Festival takes place this weekend. It is the biggest festival of the year where the best bands in the world come to play for thousands of people. This year’s line-up promises to be no exception with headliners like the Foo Fighters, Ed Sheeran and personally, the one I’m looking forward to the most, Radiohead. With Glastonbury coming up, I thought there would be no better time like the present to talk about a topic very close to me – going and enjoying music concerts as a disabled person. Admittedly, I have never been to Glastonbury before but it’s something definitely on my bucket list, but I have been to many, many concerts and some festivals in my time big and small. One of my favourite artists that I have seen a few times live is a band called Nick Cave and the Bad Seeds. I urge everyone to give this band a listen, I think they are incredible. I saw this band at a fairly medium sized venue called the Hammersmith Odeon. You may be thinking, because it’s a smaller venue their disabled facilities won’t be as good as somewhere like Wembley Arena or the O2 Arena. This is definitely not the case, at least in my experience. It’s always a good idea to check the disabled access to a venue before you go. You can also look at other people’s experiences of said venue with websites like Attitude is Everything, a charity dedicated to improve the live music experience for disabled people. Another big hurdle I’ve faced is the crowds. I can assure you I’m no Lewis Hamilton and to be honest I have failed to spot one or two curbs in my time. When I first started going to concerts, I’ve ended up in situations where I’ve been surrounded by loads of people and blocked in, luckily I’m not claustrophobic and I had someone with me, but it was still unsettling, to say the least. Now when I book my tickets I always request that there is a member of staff to assist me. A recent report came out from Attitude is Everything about the disabled access in music venue. The report highlighted some big issues, issues that affected me personally. There are always things we can improve and that can take time. Ring up the venue beforehand, take a look at the website and find out if they have suitable access for your needs. In 2014, I went to a festival called WOMAD.WOMAD (World of Music, Arts, and Dance, very hipster I know) where I saw Robert Plant’s ‘not as good as Led Zeppelin’ band. I had a great time and enjoyed the full festival experience including; transport to the festival, profile beds, hoists, and I had my own PA. Sounds expensive I know, unfortunately, I’m not that rich (yet). All of this was provided by a charity called Festival Spirit; they go to all different types of festivals and yes even Glastonbury. Live music is a great thing and should be experienced by everyone. Now, please excuse me while to see if there any Nick Cave tickets available. Great article Alex, will definitely look into Nick Cave and the Bad Seeds.